We are currently in the process of moving into a larger office space and finding furniture that will give the new office the look and feel we are going for. Naturally, I searched for different design options by googling office furniture using my Chrome Browser. Now, I can’t get rid of all of the office furniture ads that pop up regardless of what website I am visiting. That’s Google at work. 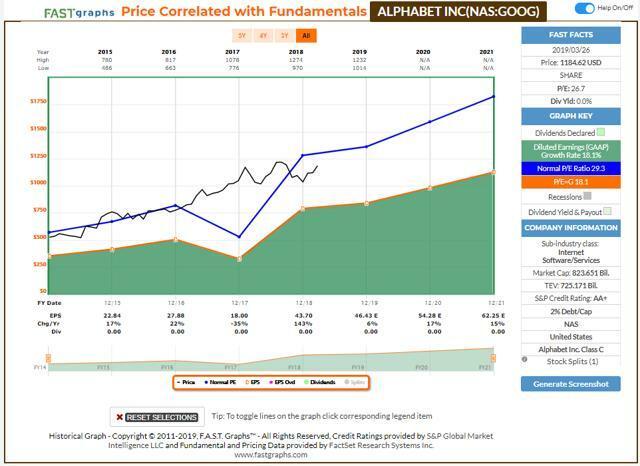 We know the company changed its name to Alphabet (GOOG) (NASDAQ:GOOGL) a few years ago, but Google still makes up the majority of its revenues and profits, despite its alphabet soup of different products and services. Most of the ‘Other Bets’ are long shot investments with lots of idealistic upside potential but most of which will fail or fail to make much of an impact to the overall business. Luckily for Google, they have $100 billion in cash that allows them a few more than three strikeouts per inning as they swing for the fences. Investors that got in early have profited handsomely from its dominance of the search and ad business, but is it too late for anyone that missed the boat the first time? If you haven’t invested in Alphabet yet and think it might be too late, think again. Here are several reasons why we think the company is still a Buy. Research and Development spending alone is more than the market cap of the largest mid-cap company. Last year, the company spent $21 billion in R&D, primarily to capitalize on new trends like virtual reality, artificial intelligence, augmented reality, machine learning, 5G and quantum computing. With $100 billion in cash currently on the balance sheet, it could afford to invest aggressively even if many of the investments fall short of expectations. One home run puts the company on track for another long run. Hardware – The company is increasing its presence in hardware to manufacture its devices end-to-end, in response to preempt the threat of rising costs from 3rd party hardware manufacturers and ensure a seamless integration between its hardware and software. The Pixel, which is built on a lean, strong, non-bloated, version of Android, is a good machine and could lead to more direct competition with Samsung (OTC:SSNLF), potentially creating an Apple (NASDAQ:AAPL)-like opportunity for Alphabet. Do not discount the possibility that Alphabet gets heavier into hardware and potentially spins out such a company. Cloud – Google’s huge presence in the cloud industry lets it to tap into the growing markets within the cloud space. The cloud computing market is estimated to be worth $623.3 billion by 2023 and the cloud storage market to be worth $88.91 billion by 2022. It has the opportunity to expand the Google Cloud business in the enterprise market over the next 3 to 5 years. There is an opportunity to capture market share and the market will likely continue to grow to accommodate IoT, edge computing and the “smart everything” world. Asia Pacific – According to analyst estimates, the Indian and Southeast Asian e-commerce market is expected to reach $150 billion by 2022 and $240 billion by 2025, respectively. And growth in Indian digital commerce is a huge opportunity for payment processing and the industry is expected to reach $1+ trillion by 2025. Google launched mobile payments platform Tez in India in September 2017. The payments industry is also expected to reach $200 billion in Southeast Asia. With Google having established a presence in these nascent markets, it is well positioned to take advantage of a significant revenue opportunity. Shared Mobility – Shared mobility market is estimated to be worth $619.51 billion by 2025 with a CAGR of 25.1% (of which Autonomous driving is estimated to be reach $556.67 billion by 2026 with a CAGR of 39.47%). Alphabet is considered to be the market leader with its offerings for autonomous driving and can establish itself as a major player in this space. Online Search and Advertising – Last but not least, Alphabet is still the leader in online advertising, deriving 87% of its revenue from online advertising. This revenue has been growing at a strong double-digit pace, which is driving double-digit earnings growth and is expected to continue to do so for at least five more years. The word Google is now commonly used as a verb when people have a question about something or are debating the facts about a topic. “Let me google it” is the de facto solution – the judge, the correct answer. The company’s 92.2% market share for internet search, including video content through YouTube, mobile OS, and internet search engines, is almost insulting to competitors considering how hard they are trying to steal market share. It has also launched Shopping Actions in an attempt to regain some of its control over product searches that have migrated to platforms like Amazon (NASDAQ:AMZN). Shopping Actions is a tool that integrates the retail experience across Google’s platforms (including mobile, desktop, and voice-powered devices). Early tests suggest that the project is increasing online shopping cart sizes by as much as 30%. Google search technology is also contracted out to major online services and communications companies, giving it a massive moat that no competitor is close to challenging short term. YouTube is a popular video viewing site with one billion hours viewed daily. That equates to 115,000 years of videos viewed daily. That large amount of viewership attracts advertisers to the site. And YouTube has entered the pay space which is directed at “cord cutters” and is now generating subscription revenue. And let’s not forget the company’s database of information on all of us. It is overwhelming and would cost tens or hundreds of billions to replicate and could take years if not decades. But wait, there’s more. Many readers are familiar with Warren Buffett and his focus on Return of Equity. After all, if you’re buying the stock, you’re interested in the return you’re getting for investing in the equity of that company, right? What strikes me as remarkable about the ROE for Alphabet is both it’s sustained level in the mid-teens and the remarkable consistency it has maintained over the last 5-6 years – especially for a mature Technology company. The analysis below indicates that ROE has fluctuated between 13% and 17% over the last 7 years with a only a brief dip into the high single digits in 2017. The consistency has been pervasive throughout its business, and using the DuPont analysis, we see that all three drivers of ROE have been steady as well. Only profit margin decreased in 2017, which is why the ROE dropped to just over 8%. But other than that, financial leverage has remained in a tight range between 1.2 and 1.31. Asset Turnover has ranged from 0.49 to 0.59. And profit margins are consistently in the low 20s – except for 2017. After a 16% annualized return over the last 5 years, you might think the stock is due for a pause. But EPS is expected to grow by 6% in 2019 and then 17% in 2020. At a normalized PE ratio of 29, the stock would be trading at a price of over $1,325, a 13% gain at the time of this writing. If EPS growth of 17% in 2020 comes to fruition, the price is likely to break through $1,500 – and that is a conservative estimate based on no new home runs playing out in the short term. According to 43 analysts providing price targets, Google is trading below even the most conservative target of $1,250 and well below the high estimate of $1,435. We rate the stock a strong buy. If you enjoyed this article, please click on the “Follow” link at the top of the article. ROI provides REIT ideas, high return opportunistic investments, and income generating ideas in dividend growth stocks, MLPs, BDCs, baby bonds, ETFs and Closed-end funds. Detailed articles on some of our best ideas mentioned in this article can be found HERE, and they are updated regularly. We also provide a number of Excel Spreadsheets such as the ROI Portfolio Dashboard and the Market Dashboard, which provides a daily view of stocks, bonds, commodities, and currencies. Disclosure: I am/we are long GOOG. I wrote this article myself, and it expresses my own opinions. I am not receiving compensation for it (other than from Seeking Alpha). I have no business relationship with any company whose stock is mentioned in this article. Additional disclosure: This article is meant to identify an idea for further research and analysis and should not be taken as a recommendation to invest. It does not provide individualized advice or recommendations for any specific reader. Also note that we may not cover all relevant risks related to the ideas presented in this article. Readers should conduct their own due diligence and carefully consider their own investment objectives, risk tolerance, time horizon, tax situation, liquidity needs, and concentration levels, or contact their advisor to determine if any ideas presented here are appropriate for their unique circumstances. 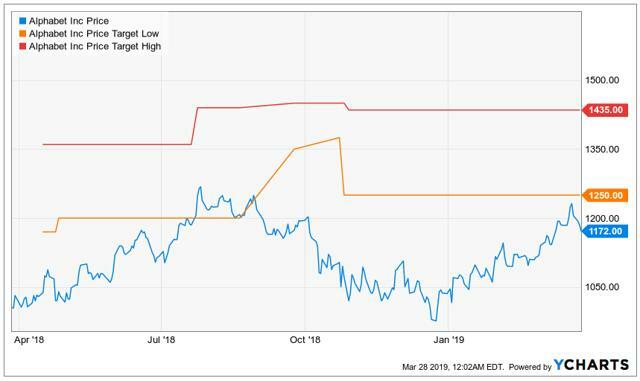 Last week we covered 3 high yield stocks which had been left behind by the market in 2019. This week we’re checking out 3 high yielders which have outperformed the market in 2019. All 3 of them are vehicles from Gladstone Corp: Gladstone Investment Corp., (GAIN), and Gladstone Capital Corp., (GLAD), are business development companies, while Gladstone Commercial Corp., (GOOD), is a REIT. GAIN focuses on acquiring mature, lower middle market companies with $20 to $100 million in revenue, whereas GLAD was one of the earliest BDCs and focuses on investing in loans to lower middle market businesses. GOOD invests in and owns net leased industrial, commercial and retail real property and selectively makes long-term industrial and commercial mortgage loans. 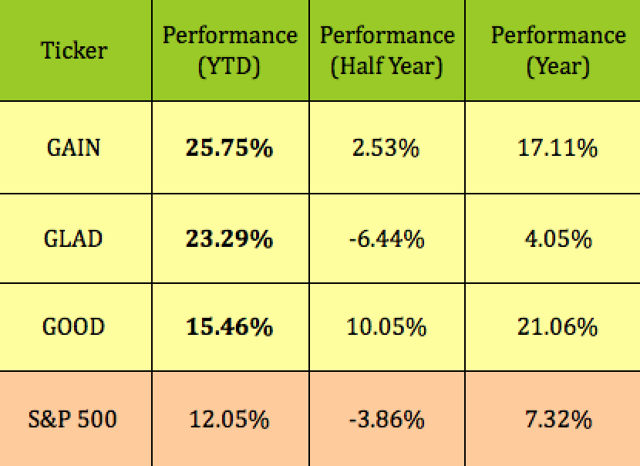 All 3 have benefited from an increasingly dovish Fed, with very good price performance so far in 2019, with GAIN leading the pack, at 25.75%, followed by GLAD, at 23.29%, and GOOD, at 15.46%, vs. 12.05% for the S&P 500. 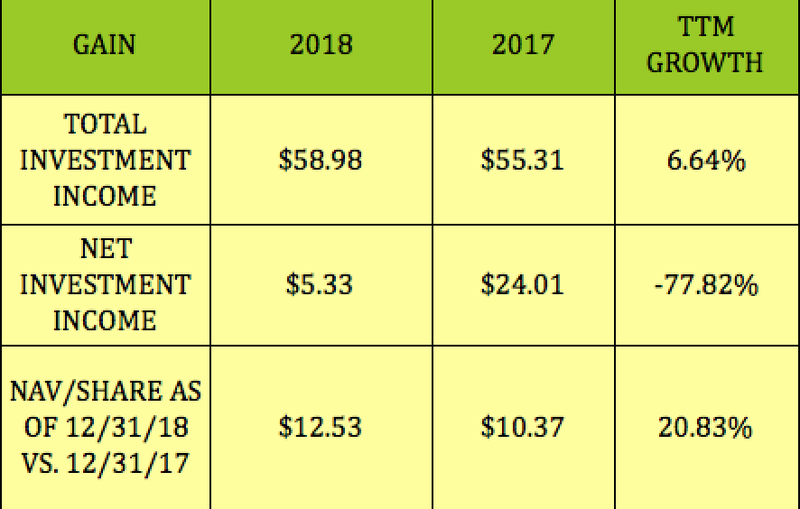 All 3 companies distribute monthly dividends, and go ex-dividend ~ the middle of the month, with pay dates near the end of the month. The dividend payout ratios are based upon net investment income – NII – for GAIN and GLAD, and Funds From Operations – FFO – for GOOD, since it’s a REIT. GLAD currently has the highest yield, at 9.32%, followed by GOOD, at 7.16%, and GAIN, at 6.97%. GAIN has a much lower payout ratio than the other 2, at ~29%, and the best 5-year dividend growth rate, at 6.55%. GAIN’s 2018 payouts were classified as 75.42% ordinary dividends, with the balance being capital gain dividends and qualified dividend income. 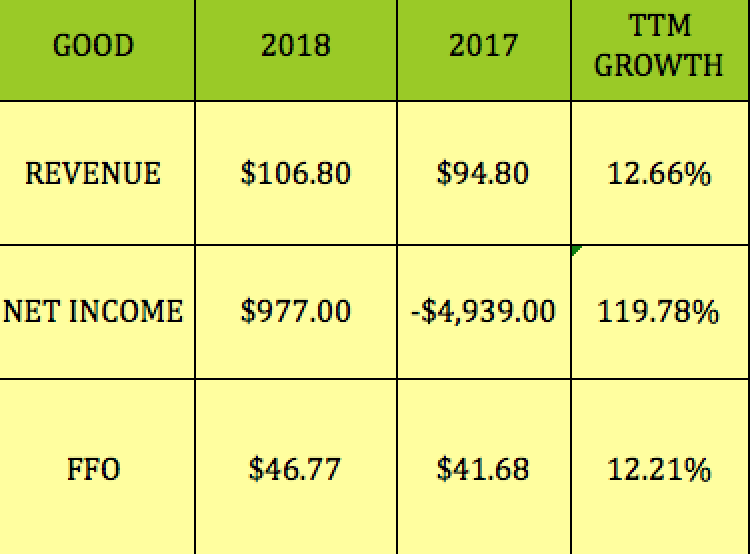 GLAD’s 2018 payouts were classified as 97.8% ordinary dividends, with the balance being classified as qualified dividends. 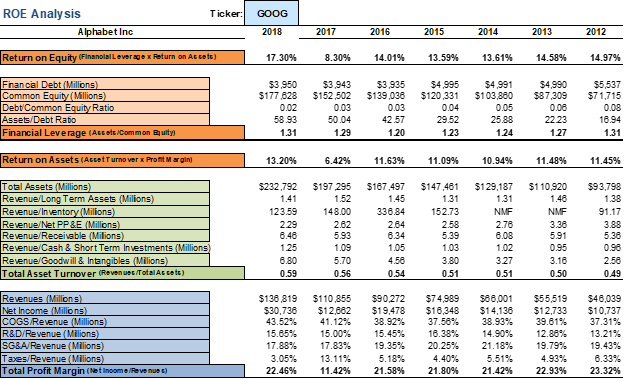 GOOD’s 2018 payouts were classified as 75.52% Return of Capital, with the balance characterized as an ordinary dividend. 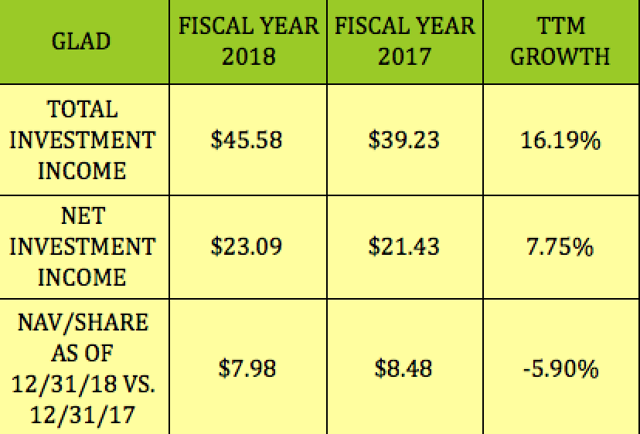 GAIN had 6.6% growth in total investment income, but its net investment income dove -77.82%, due to higher expenses, including ~$13M in higher incentive fees, $2.5M in higher interest expenses, and ~$1.4M in added G&A expenses. Its NAV/share rose by 20.83% in calendar year 2018, to $12.53. 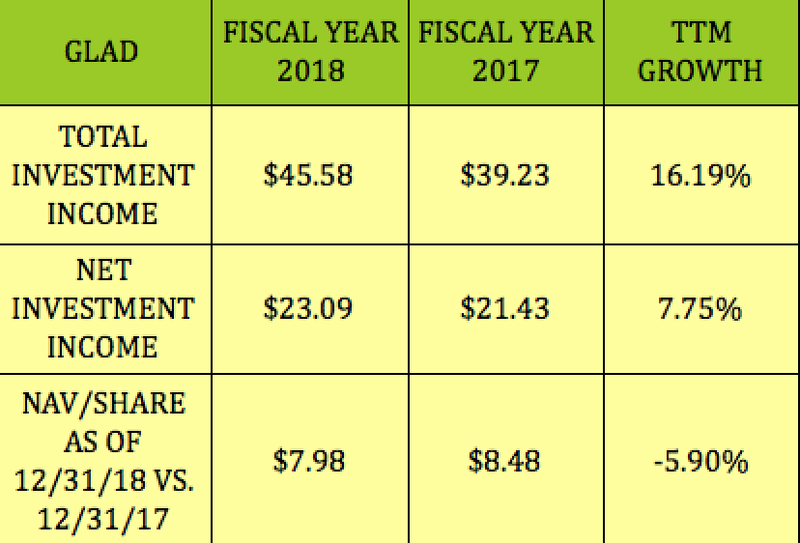 GAIN’s most recent fiscal year ended on 3/30/18, so we assembled calendar years 2018 vs. 2017 figures. All 3 companies have a fairly recent history of insider buying. These 3 insider buying tables are sourced from Finviz. 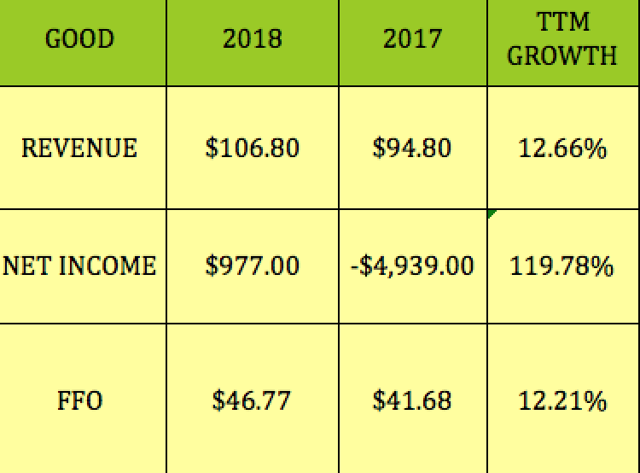 Meanwhile, GOOD’s management has kept the buying spree going into March ’19, but at a more modest pace than the other 2 companies’ 2018 purchases. GOOD’s president Robert Cutlip has amassed over 48,000 shares. Nice to see management with skin in the game. BDC’s GAIN and GLAD are both selling at valuations slightly higher than Book Value, at 1.08X and 1.13X respectively. 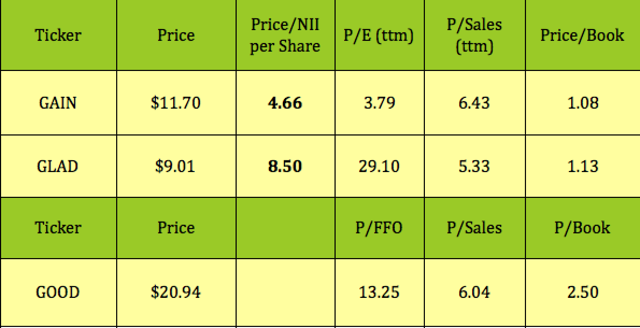 GAIN shows a much lower Price/Net Investment Income – NII – of 4.66, while GLAD comes in at 8.55, nearly twice as high. Their trailing P/Es vary widely, with GLAD showing 29.10, vs. 3.79 for GAIN. GOOD shows a trailing Price/FFO of 13.25, with a higher Price/Book of 2.5X, and a similar Price/Sales of 6.04X. GAIN also has the biggest upside spread vs. analysts’ average price targets, at 5.21%, vs. 3.63% for GOOD and -8.1% for GLAD. GAIN wins the race over GLAD in the Financials category also, with a higher ROA, ROE, and Operating Margin, and slightly lower debt leverage. 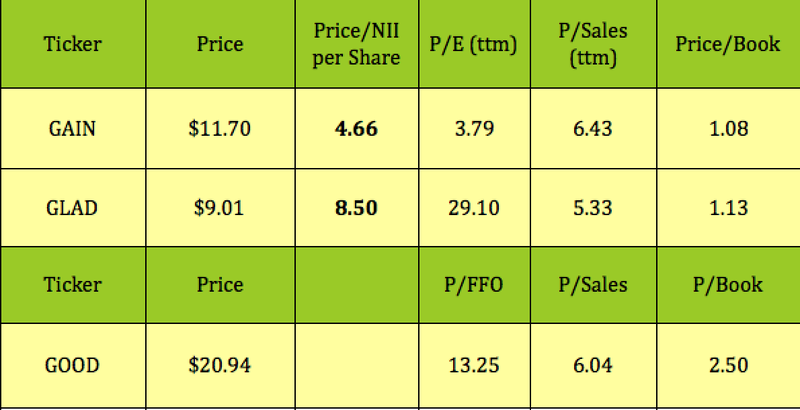 GOOD’s ROA of 2.39%, ROE of 3.57%, and 33.50% Operating Margin compares well vs. broad diversified REIT averages of 1.18%, 2.82%, and 23.75% respectively. Its Debt/Equity of 1.67 is also lower than industry averages of 2.77. All 3 of these vehicles have options available, with GOOD’s cash secured put options being the most interesting. We added this September trade to our free Cash Secured Puts Table, where you can see more details for it, and over 35 other put-selling trades, all of which are updated throughout each trading day. GOOD’s September $20.00 put pays a bid of $.65, which is $.10 below its total monthly dividends during this 6-month period. It has a breakeven of $19.35. If you’re new to options selling, we have an Options Investing Glossary which defines the terms you’ll encounter in this type of trading. We rate GAIN a Buy, based upon its lower valuations, better payout ratio, and bigger upside variance to the average price target. There are also preferred shares and exchange-traded notes for GLAD and GOOD. Our Marketplace service, Hidden Dividend Stocks Plus, focuses on undercovered, undervalued income vehicles, and special high yield situations. We scour the US and world markets to find solid income opportunities with dividend yields ranging from 5% to 10%-plus, backed by strong earnings. We publish exclusive articles each week with investing ideas for the HDS+ site that you won’t see anywhere else. Find out now how our portfolio is beating the market in 2019. Disclosure: I/we have no positions in any stocks mentioned, but may initiate a long position in GAIN over the next 72 hours. I wrote this article myself, and it expresses my own opinions. I am not receiving compensation for it (other than from Seeking Alpha). I have no business relationship with any company whose stock is mentioned in this article. Additional disclosure: CLARIFICATION: Our legacy website, www.DoubleDividendStocks.com, has focused on options-selling for high dividend stocks, for the past 10 years. Talent issues are top-of-mind for business leaders in 2019. In fact, according to a new report from my organization, CEOs of small and midsize businesses rank decisions about talent higher in importance than decisions about customers and financials. Despite concerns for the economy, 65 percent of the 1,257 CEOs included in the Q4 2018 Vistage CEO Confidence Index report said they planned to increase hiring this year. This was a shade lower than the recent 15-year peak of 71 percent, but current recruitment intentions are still greater than at any other time recorded by our survey since 2003. With the United States almost at full employment and wages rising, hiring won’t be easy during the next 12 months. CEOs are employing a variety of strategies to cope with this challenge, such as boosting wages (64.6 percent), adding employee benefits (36.1 percent), investing in equipment to automate tasks (35.2 percent) and allowing employees to work remotely (25.1 percent). However, there are other strategies to consider. Here are two that I recommend. One of the most effective ways to source new talent is through employee referrals. Engage your existing workforce in the recruitment process by starting a referral program that provides incentives to employees to help bring the best people on board. Start an open conversation with all employees about how you reward effort to address any questions about compensation. Professional networks can also be a valuable source of top talent. Use them to target both people who are actively seeking new roles and those who are happy working elsewhere, even if that’s with your competitors. Nearly three-quarters (71 percent) of the CEOs we surveyed recognized employee development will be key to their talent-management strategy in 2019. People are a business’s number-one asset. Giving them room to grow in the organization is one of the most effective ways of making them feel more valued, which can increase their productivity and make them stick around longer. But don’t stop at training workers to be better in their current roles. Give them opportunities to develop communication, collaboration and leadership skills, and recognize their achievements with managed career progression. Connect senior leaders to junior team members through a mentorship scheme, too, and you’ll soon have a strong talent pipeline. DUBAI (Reuters) – Bahrain, headquarters of the U.S. Navy’s Fifth Fleet, plans to roll out a commercial 5G mobile network by June, partly using Huawei technology despite the United States’ concerns the Chinese telecom giant’s equipment could be used for spying. Washington has warned countries against using Chinese technology, saying Huawei could be used by Beijing to spy on the West. China has rejected the accusations. VIVA Bahrain, a subsidiary of Saudi Arabian state-controlled telecom STC, last month signed an agreement to use Huawei products in its 5G network, one of several Gulf telecoms firms working with the Chinese company. “We have no concern at this stage as long as this technology is meeting our standards,” Bahrain’s Telecommunications Minister Kamal bin Ahmed Mohammed told Reuters on Tuesday when asked about U.S. concerns over Huawei technology. The U.S. embassy in Bahrain did not immediately respond to a request for comment. Early movers like the United States, China, Japan and South Korea are just starting to roll out their 5G networks, but other regions, such as Europe, still years away and the first 5G phones are only likely to be released in the second half of this year. Bahrain’s state controlled operator Batelco is working with Sweden’s Ericsson on its 5G network, while the country’s third telecom Zain Bahrain is yet to announce a technology provider. No foreign company is restricted by the government from providing equipment for Bahrain’s 5G network, Mohammed said, adding that the mobile operators chose who they worked with. Mohammed said the rollout of the 5G network was an “important milestone” for Bahrain, which is hoping investments in technology will help spur the economy which was hit hard by the drop in oil prices. “It is something we are proud to have,” he said. Techno-optimist prognosticators will tell you that driverless trucks are just around the corner. They will also gently tell you—always gently—that yes, truck driving, a job that nearly 3.7 million Americans perform today is perhaps on the brink of extinction. At the very least, on the brink of uncomfortable change. A startup called Peloton Technology sees the future a bit differently. Based in Mountain View, California, the eight-year-old company has a plan to broadly commercialize a partially automated truck technology called platooning. It would still depend on drivers sitting in front of a steering wheel but it would be more fuel efficient and, hopefully, safer than truck-based transportation today. The company employs ten professional truck drivers to help refine its tech, and I’m about to meet two of them out on Peloton’s test track in California’s Central Valley. Michael Perkins is tall, thin, and has been driving very big trucks for about 20 years. Jake Gregory is shorter and picked up truck driving in college, before taking a detour to the FBI. We hit the highway first, because the rain has suddenly cleared. (Here’s an unfortunate reality about Peloton’s driver assistance tech: It doesn’t work great in the rain. Or snow. It’s a safety issue. More on that later.) Out on Interstate-5, Perkins’ long, white semitrailer cruises along in front of me. I’m on board the second, identical truck behind it, with Gregory behind the wheel. A small screen mounted on Gregory’s dashboard shows a camera view of what’s happening in front of Perkins’ rig. It’s like their trucks are connected. Which, in fact, they are about to be. Perkins radios in that he’s ready to go; Gregory says he is too. Inside the two truck cabs, each driver hits a button. Three ascending tones—la, la, la—means Peloton’s automated system has authorized the trucks to platoon on this stretch of highway. A dedicated short range communications (DSRC) connection is now established between the two vehicles. It’s like WiFi but faster and easier to secure. Now, whatever the front truck does, the back truck in will near-simultaneously “know”—and react accordingly. Then Gregory speeds up, pulling his truck up so it’s tailgating about 70 feet from the leader. Sounds risky! But right now, the two trucks are platooning. Ours is on a kind of hopped-up cruise control, which means Gregory’s feet aren’t actually controlling the brakes or accelerator. At the same time, Gregory maintains control of his steering wheel. If Perkins were to brake, hard, Gregory’s truck would, too, faster than a human could. The robots have taken over. Kind of? Not really? More like, they’re collaborating, with some human oversight. Peloton’s name, a reference to bicycle racing, helps explain how this platooning works. Just as the riders in the peloton, or main group of racing cyclists, preserve energy by drafting off of those around them, the following trucks in the truck platoon reduce their aerodynamic drag by drafting off the ones in front of it. The lead truck, meanwhile, get a little push. This saves fuel, according to Pelton—up to 10 percent for the following car and 4.5 percent for the first one, depending on the road and weather conditions and the following distance. It might also prevent crashes, since this tech has much faster reaction times (about 30 milliseconds) than puny humans (about 1 to 1.5 seconds). Other companies in Europe, China, Japan, and Singapore are seriously experimenting with truck platooning. The American military has hosted platooning demonstrations. Just this week, the US Department of Transportation gave out $1.5 million in grants to universities studying the tech. And Peloton has tested in a bunch of US states: Arizona, California, Michigan, Florida, and Texas, where Peloton has immediate plans to run the majority of its routes. Right now, the company says it does have paying customers, though it won’t reveal their names until later this year. 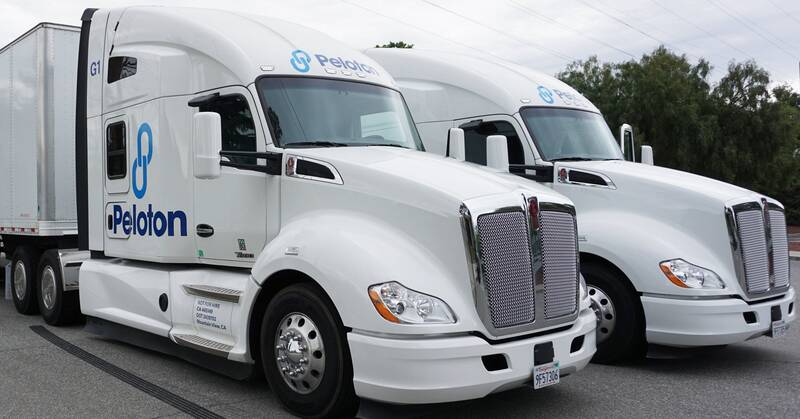 According to Josh Switkes, the company’s CEO, some pair of US truck drivers are running a route while platooning on a Peloton-enabled truck every day. And testing continues, on the software in its office, on its test track, and on actual highways, where it confirms the technology’s reliability. “The highway or field is not for testing,” Switkes says. “The goal of testing is to find failures, and you don’t want those failures to be on public roads.” In a report released today, the company lays out this approach to safety for regulators and interested industry parties alike. It borrow from automotive processes more than Silicon Valley-style software ones, amounting to something like, easy does it. It turns out, the linking-up move Perkins and Gregory just performed on I-5 is one of the most safety-critical parts of truck platooning, says Switkes. The moment when the following truck has to move faster than the one in front of it is the most dangerous part. To make sure drivers like Perkins and Gregory don’t crash into each other, or anyone else, Peloton needs to make sure that the platooning drivers know how the tech works. (Right now, the company’s driver training process takes about a half a day.) It also needs to understand exactly how heavy the trucks are when they start platooning, how their brakes are working, and how their tires function. For this reason, the company says, it has carved out partnerships with its suppliers, which means its trucks are built from the ground up with platooning in mind. And if that seems a little dull, Switkes would tell you that’s the point. His favorite word is “pragmatic,” and he doesn’t believe driverless trucks will prowl the highways any time soon. The technology is too complicated, he argues, and developers will have to go through years of safety testing before they’re ready for the roads—and before the public feels safe riding in their own bitty cars around 50,000-pound robot trucks. So Peloton is going all in on making human-based driving both safer and more efficient. With a bit of tech boost. Platooning advocates disagree, but even the most supportive believe finding a market for this trucker assistance isn’t simple. Steven Shladover is researcher with the California Partners for Advanced Transportation Technology program at UC Berkeley. He has studied platooning for two decades, and points out that the truck industry would need to execute a fair bit of choreography to pull off platooning. Fleet operators would have to coordinate deliveries, matching up trucks heading in the same direction at the same time. “Does the truck industry see enough of a benefit in platooning to fit it into their operational strategies?” he says. While everyone in trucking waits to find out, Perkins and Gregory head back to Peloton’s test track and proceed to show off a few, freakier moves: some hard braking, some driving side-by-side to prove that the trucks can still “talk” to each other in that position. At one point, another company employee in a white Toyota Tundra cuts into the 55-foot space between the two trucks, and they smoothly part to make room for him. Maybe platooning will improve life for truckers—too bad it can’t fix the problem of everyday reckless drivers, too. BRUSSELS (Reuters) – Alphabet’s Google will prompt Android users to choose their preferred browsers and search apps, a senior Google executive said on Tuesday, as the company seeks to allay EU antitrust concerns and ward off fresh sanctions. The European Commission last year handed Google a record 4.34 billion euro ($4.9 billion) fine for using the market power of its mobile software to block rivals in areas such as internet browsing. Google will now try to ensure that Android users are aware of browsers and search engines other than its own services, Kent Walker, senior vice-president of global affairs, said in a blog. “In the coming months, via the Play Store, we’ll start asking users of existing and new Android devices in Europe which browser and search apps they would like to use,” he wrote without providing details. Google could be fined up to 5 percent of Alphabet’s average daily worldwide turnover if it fails to comply with the EU order to stop anti-competitive practices. Just about every day, AT&T (T) reminds investors of how bad the company wasted shareholder money with mega acquisitions. The latest news regarding the DirecTV Now service is again a reminder that the company needs to focus on repaying debt far beyond the stated objectives as any other management moves will hurt the stock. AT&T is stuck at $30 for the time being, at least offering shareholders at 6.7% dividend yield to offset the suffering. A prime reason for purchasing DirecTV was the ability to offer a competitive streaming service. After the purchase, AT&T launched DirecTV Now to some initial success, but the company is now crushing a major reason for paying $48.5 billion in the mega merger. AT&T announced plans to raise the lowest price for DirecTV Now to $50 while stripping out cable channels from Viacom (VIAB) and AMC Networks (AMCX) in order to make the service profitable. The whole problem with the OTT concept from AT&T was the service too resembled traditional media services with a large bundle of channels. The company now offers two bundles at $50 and $70 with HBO included in basic packages that cost $10 more despite dozens of channels stripped out of the mix. According to the Verge, AT&T now has the highest base plan cost of the five major streaming services that’s now led by Sling TV (DISH) and Hulu with Live TV owned via a future majority by Disney (DIS). We’re talking $50 to $60. We’ve learned this product, we think we know this market really, really well. We built a 2 million subscriber base. But we were asking this DirecTV Now product to do too much work. So we’re thinning out the content and getting the price point right; getting it to where it’s profitable. The end result is a service already cutting customers after just reaching the 2 million subscriber base. DirecTV Now lost 267,000 customers during Q4 when Hulu replaced the service at the 2 million customer base. In addition, AT&T lost 403,000 satellite customers, suggesting the company is quickly unraveling a lead in pay-TV services. The only good news is that the move shifts the focus to making the business profitable and profits lead to keeping the large dividend. The wireless and entertainment company finds itself in the middle of a video streaming war where the purchase of Time Warner (NYSE:TWX) actually pits itself against DirecTV. Offering the DirecTV Now bundles at a loss just left AT&T supporting content providers to compete against Time Warner properties. The company is now quickly headed toward mostly WarnerMedia products with the following video streaming services. The planned entrance of Apple (AAPL) into the streaming wars on March 25 further adds to the upheaval in the sector. The tech giant has reportedly had a $1 billion budget for content and could give the service away for free in order to attract subscribers for other video subscription services such as HBO where Apple takes a cut. Hulu runs a money-losing operation that can afford to wait out the competition. 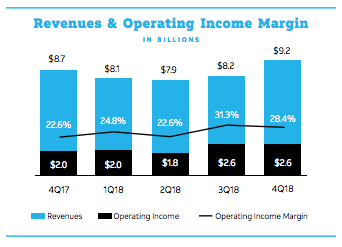 One should expect DirecTV Now to lose a substantial portion of their subscribers while traditional pay-TV services remain in a substantial downtrend. 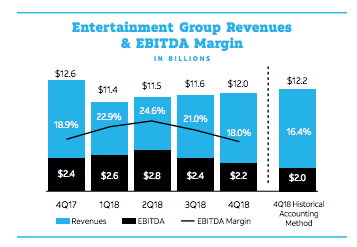 Luckily, the entertainment business is the smallest profit generator of the new AT&T. The division only had $2.2 billion in Q4 EBITDA and operating income of $826 million. Cutting back on DirecTV Now should help stabilize the profit levels of the entertainment group. The biggest risk to the bullish investment thesis is the media business from the new WarnerMedia. Most of the content providers have a strong profit incentive, but a lot of the new content services from tech players like Apple are as interested in subscribers than initial profits. The media division had Q4 operating income of $2.6 billion that is now at risk from a competitive environment. CFO John Stephens didn’t exactly provide welcoming comments at the recent Deutsche Bank Media conference. The financial executive sees headwinds during Q1 from wireless equipment revenues to the tune of $100 million and at least another $200 million from the amortization of wireless commissions. The biggest problem is that the CFO doesn’t even address the DirecTV hit from the pricing increase. The company will lose customers, though again this may not hit EPS with the DirecTV Now service running at an apparent loss. Not addressing this issue further strengthens my resolve that the AT&T executive management team isn’t leading the market, but rather following directions made by other industry players, whether in wireless, entertainment or media. The mega-mergers of DirecTV and Time Warner are both proving to be examples of management skating to where the entertainment and media sector was at and not heading toward where the market is going. The company isn’t leading the market which is a traditional weakness of a conglomerate that’s far too slow to act. For this reason and until AT&T gets new executive leadership, the company needs to be on a strict debt repayment diet. No more transformational acquisitions where past industry leaders are bought at a premium. My previous thoughts on the stock rallying to $40 are starting to fade. 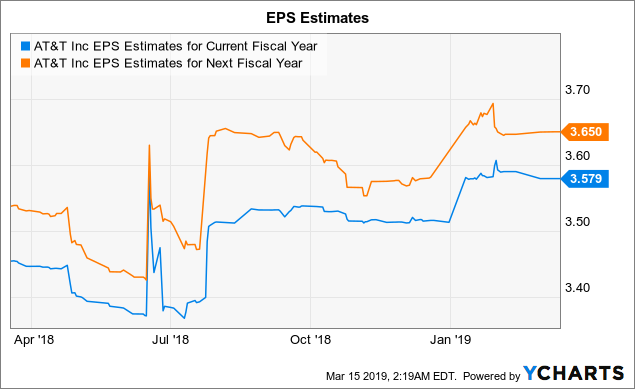 The wireless giant isn’t generating the EPS growth envisioned with the acquisition of Time Warner or even approaching the hopes of reaching a $4 EPS target. Analysts see the company earning a max of $3.65 per share in 2020. For this reason, AT&T is likely headed to minimal capital gains due to a lack of confidence in the management team surrounding the risks to these estimates due to the competitive entertainment and media sectors. The best hope is collecting the 6.7% annual dividend with a forecasted mid-50% payout ratio. The company hit a payout ratio of 60% last year. The key investor takeaway is that the market already has lost complete faith in the wireless giant. Despite buying both DirecTV and Time Warner, AT&T already is a major laggard in the video streaming space. The only hope while this executive team is in charge is cutting costs, reducing debt and paying the large dividend yield. Disclosure: I am/we are long T, AAPL. I wrote this article myself, and it expresses my own opinions. I am not receiving compensation for it (other than from Seeking Alpha). I have no business relationship with any company whose stock is mentioned in this article. Additional disclosure: Disclaimer: The information contained herein is for informational purposes only. Nothing in this article should be taken as a solicitation to purchase or sell securities. Before buying or selling any stock you should do your own research and reach your own conclusion or consult a financial advisor. Investing includes risks, including loss of principal.